Retransfer technology (Reverse Transfer) maximizes print quality: High resolution 600 dpi: images and text are rendered perfectly and micro-text and watermarks are printed in high definition. Over the edge printing: this printer will guarantee that your edges print perfectly since the fi lm fully covers the card. Evolis High Trust® consumables: their use provides flawless results. The Avansia Retransfer technology can print on all types of cards (PVC, PET, polycarbonate, ABS), including uneven card surfaces, such as smart contact and contactless cards. The standard built-in card flattener delivers perfect results. To meet your specific needs, Avansia can be configured for all types of data encoding options: magnetic stripe, contact and contactless smart cards. These factoryconfi gured encoding options can be combined. 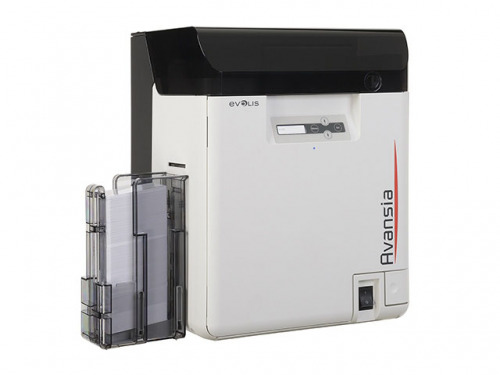 Avansia is exceptionally fast with an output of more than 140 single-sided color cards per hour. Thanks to the high capacity feed tray and output tray (250 cards each) - and high capacity consumables (500 prints per roll), you can print your card runs with no interruptions.